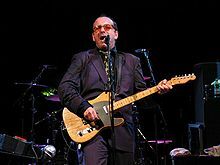 Declan Patrick Aloysius MacManus (born 25 August 1954) is an English musician, singer, and songwriter, primarily known by his stage-name Elvis Costello. It was embarrassing to watch these people fall into the trap of their own critical conceits. We weren't to know that within a month of my first album actually being issued Elvis Presley would die, and it would actually be a talking point. I can't actually play any instrument properly. I can't read music. And here's the New York Times calling me the new George Gershwin. It was so ridiculous, really embarrassing. It was embarrassing to watch these people fall into the trap of their own critical conceits. The people with the most resources are the federal government. If you can invade a country halfway across the world in a matter of days, you can surely come to the aid of your own citizens in a shorter order of time. I had a lot of problems with my name … my first name Declan is really not very well known outside of Ireland, MacManus is a name they could never spell ... if you think about the names of '76, '77 … I got off kind of lightly — with a name you could live with, you know, in time. … I kind of liked the dare of it. Of course we weren't to know that within a month of my first album actually being issued Elvis Presley would die, and it would actually be a talking point. … Let me put it this way — people don't forget you with that name. It's sort of receded as — and this may sound terribly disrespectful and heretical — but as Elvis Presley has receded as a musical force, people make much less of a case about it. Elvis is a sort of cultural figure but there is no direct line between the music of Elvis Presley and the music of today. There is none whatsoever, he's no influence whatsoever, that I can detect, on music made today. Other than people who consciously retro in styling themselves after his ideas. There is no direct impact in the way that you can hear the influence of The Beatles or Stevie Wonder or numerous other people. My sense of history in music is much greater than a lot of people's. I listen a lot further back in the whole history of music. I've had a lot of different experiences in music over the years. And not everything you do can satisfy everybody's idealised version of you. Obviously, when I started out, I had a little bit more curiosity than some, and went seeking out the original artists, or in some cases searching up country music. I followed The Byrds a lot, and then when they did a country styled record it made me curious to know who these people were that they liked. My sense of history in music is much greater than a lot of people's. I listen a lot further back in the whole history of music. It's not just pop music of the last 20, 30, 40, 50 years. I'm listening to stuff from hundreds of years ago as well, because you can learn from everything. We stayed out of Memphis early on in the late 70s for obvious reasons. People were very sensitive about Elvis Presley, and my stage name obviously would be provocative to some people in that area at that time. So we didn't visit Memphis until about 1984. The first song that most people picked up on, particularly in America, of mine, was a ballad, not a rock'n'roll song. It was 'Alison', and that's an R&B ballad. I don't think there's any other way to describe it. These are the sort of things that push you on in music — the curiosity, a passion for new ideas. It's important to keep restoring that, and at the same time, hold on to the core things about music that whenever you pick the simplest form of instrument; guitar or piano, you can find a song that's worthwhile. I don't feel any form of music is beyond me in the sense of that I don't understand it or I don't have some love for some part of it. And if there's something in it that I can respond to, then there's something that I might be able to use as a composer. There are records of mine that have had smaller audiences and have provoked really drastic responses from people — particularly from critics — who maybe don't have quite enough time to live with the record or accept that a piece has its own integrity. Now you're not the only one. 'Cause I know what I've done. Oliver's Army This song makes reference to the British army and to Oliver Cromwell. But he's the one who loves to hate. Somebody's watching where the others don't walk. When you're old enough to know better. Going on to meet your reward. You might have never heard, but God's comic. But I think you're shrinking. Writing about music is like dancing about architecture — it's a really stupid thing to want to do. This has commonly been paraphrased "Talking about music is like dancing about architecture." More info at "Alan P. Scott : Talking about music..." Also, Costello has denied having coined this, in an interview in Q magazine, tentatively attributing the quote instead to Martin Mull. Though Costello's cover became a hit, "(What's So Funny 'Bout) Peace, Love, and Understanding", was actually written by Nick Lowe.